This year in Zihuatanejo we saw a renewal of Mexican and regional cultural traditions related to Day of the Dead. It seems that much of our local society here in Zihuatanejo as well as the rest of the Costa Grande have noticed that we have been losing the traditions of our forefathers and that the young people of today are forgetting little by little the rich Mexican culture that dates back to prehispanic times. That is the reason why cultural events were organized this year in order to recognize the traditions related to Day of the Dead, which is celebrated each year on November 2. 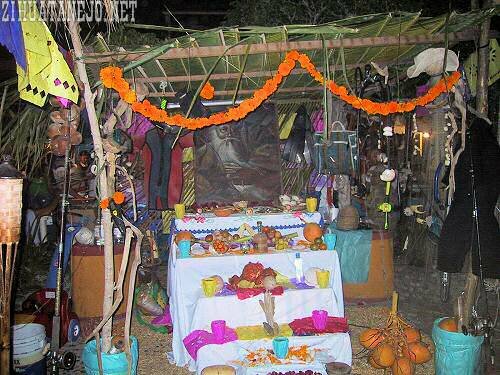 Shown below are some of the altars that were placed in the main plaza as part of a competition. 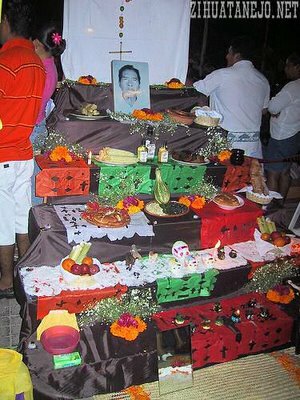 All adorned with representative offerings of things associated with the dearly departed as well as the traditional flower called zempazuchitl. 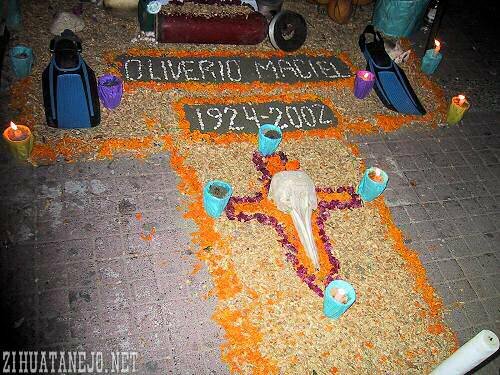 One of the altars was for the renowned local diver Oliverio Maciel. A dolphin's skull can be seen in the middle of the cross of flowers. There was also a beautiful sand-sculpture in the gazebo of an angel praying over a sea turtle. 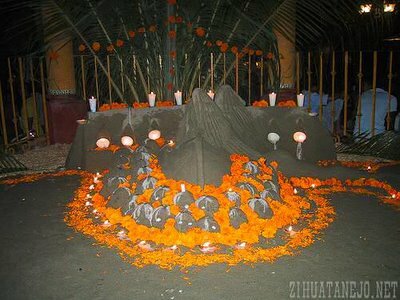 Other altars were representative of graves, also made with sand from the Playa Principal in front of the Zócalo. 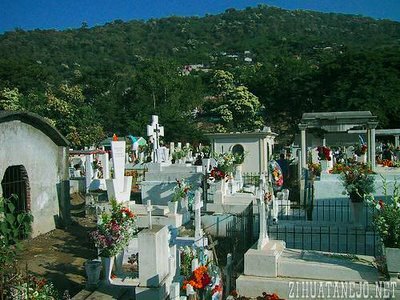 As happens every year, families of the region clean and adorn the graves of their deceased loved ones at the municipal cemetary located in Agua de Correa. 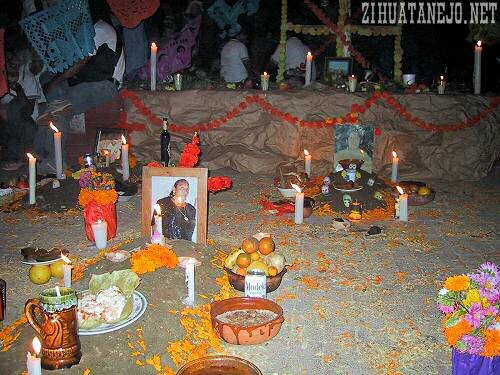 On the 1st of November the children are remembered, and on the 2nd of November the adults are remembered. It is a solemn occasion even though it is common to see musicians singing as well as familes and friends sharing happy moments remembering their loved ones. 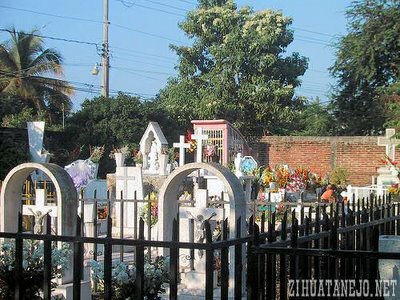 In the photos you can see flowering trees called bocotes in and around the cemetary as well as dotting the hillsides with their white flowers. In our region of Guerrero these trees always flower during the week when Day of the Dead occurs, and for this reason they are associated with this day. 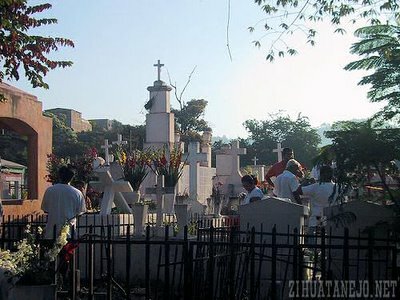 Posted by ZihuaRob at 9:09 a.m.